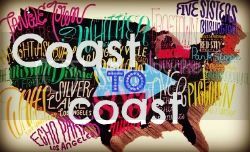 Check out my Runner Spotlight on Road Runner Girl, here. 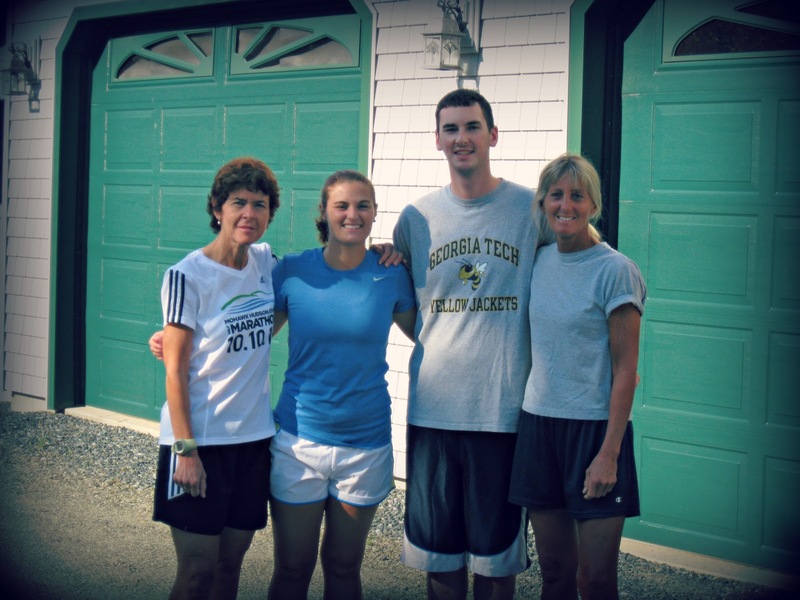 When Mike and I started running, we only ran with each other. We completed the entire Couch-to-5K program and Bridge-to-10K program without running with anyone else (with the exception of one time in Atlanta, Georgia when we ran with my mom). 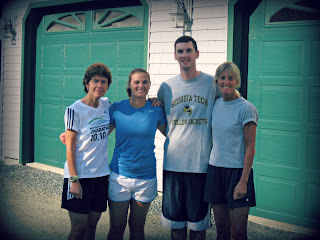 While we were training for our first half marathon we ran with my mom and Mike's mom in Maine, but other than that we didn't really run with other people for a long time. I almost pulled a Mike, but my eyes ARE open! Part of the reason we didn't run with anyone else is because we didn't know any other runners. Other than our moms, and a few people here and there, we didn't hang out with people who ran regularly. 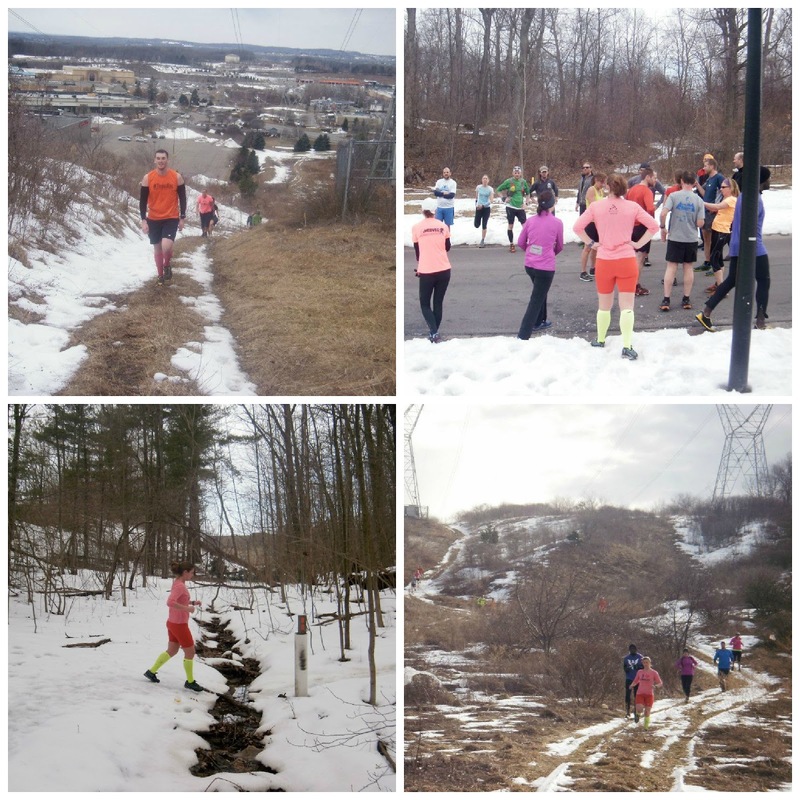 After I started blogging and we became more active in the local Rochester running scene, we started to make friends through running. Then, we started to run WITH those friends. Since the middle of February we have gone on quite a few group runs. Most of these runs have just been with another person, or a few other people, but this weekend we participated in two unique group runs. On Saturday we went to the annual Run Around the Bay (different from the Around the Bay 30K we are running in two weeks) in Irondequoit, New York. 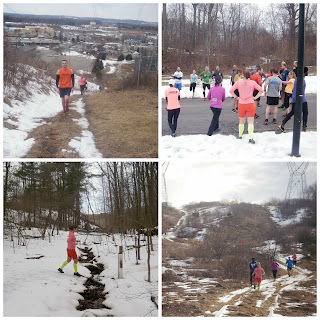 About 100 to 200 runners from various running groups (or runners in general like us) in the Rochester area came together to run around Irondequoit Bay. 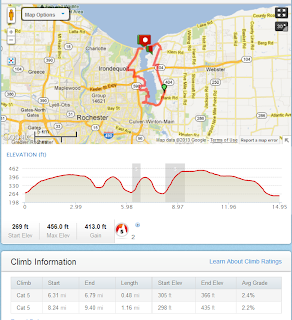 The route and the elevation, two category 5 hills! There were a few route options and Mike and I did the 15 mile route. While it was a "group" run, we were primarily running alone since everyone else was really fast! When the 15 mile route connected with the 13 mile route we did see some more runners. It was a fun time anyway! 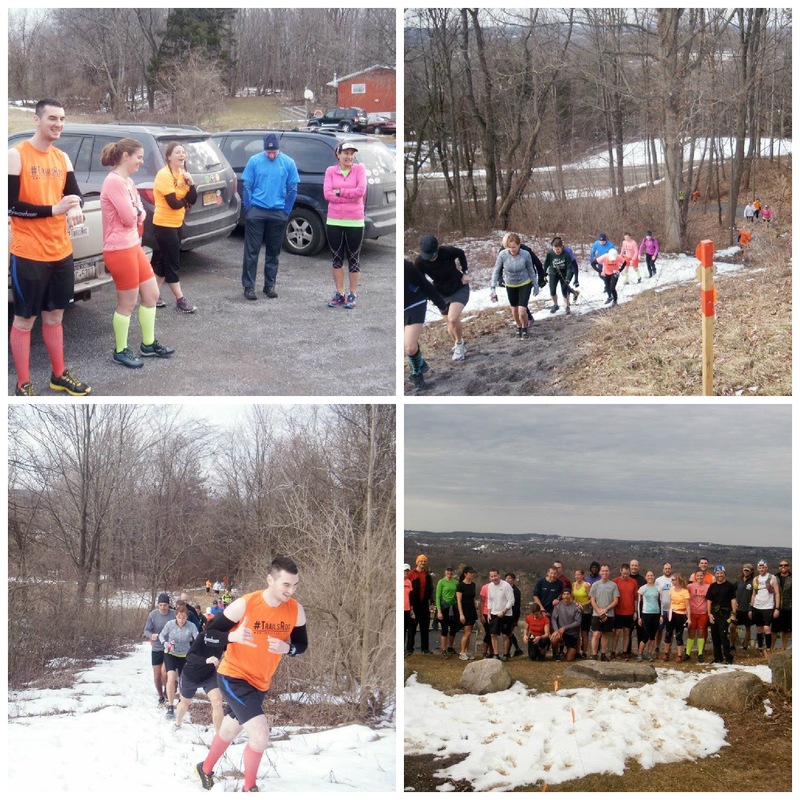 Then this morning we hit the trails (which is where the majority of our group runs happen) for the 0 SPF Trail Half Marathon preview run. We aren't running this race, it is the weekend after our Half Ironman, but we are volunteering. About 30-40 people came out to run the first 4 miles and the last 4 miles of the course (it is an out and back). I love running with Trails ROC and other trail runners, but it was tough the day after a 15 miler. If it was just me and Mike, I probably would have given up or turned around. Luckily, the group setting motivated me to finish! And the promise of dirt cake at the end didn't hurt either! 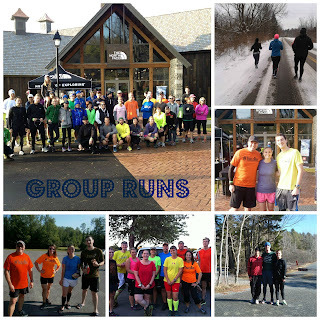 Mike and I have enjoyed adding group runs to our running routine (and I would like to add group rides, soon). It is a nice change of pace (literally and figuratively) from running solo or with just each other. This Runner's World article describes the benefits of solo running and social running, and also emphasizes that it is good to have a mix of both. We agree! Do you like social running, solo running or a mix of both? I've been enjoying a mix of both! In fact, we started a little facebook group to ask people in our neighborhood if they want to meet up! (It's easier than texting six people...) Even though I like group/social runs, running is so therapeutic for me that I NEED to do some on my own. I've been doing a mix of both, primarily because I'm training for a marathon with a time goal. Usually I love running group runs, but I end up talking a lot lol I have to focus a few more weeks on my marathon, then I can get back into my social runs! what a fun group!!! that's awesome! I used to always run by myself and then started running with a small group which has led to several other groups. I think a mix is definitely the best. Your group runs look like lots of fun! I think it's awesome that you run with so many groups. I just started running with friends and they really make the miles fly by! I'm happy for you and Mike doing so many runs together first. If I were to do that many with my significant other (well we would be living closer so that would be nice) but I'd get so tired of him. Plus he is way faster so it wouldn't help him and I'd get so frustrated trying to speed up. That being said, it's nice to run with him when I can. 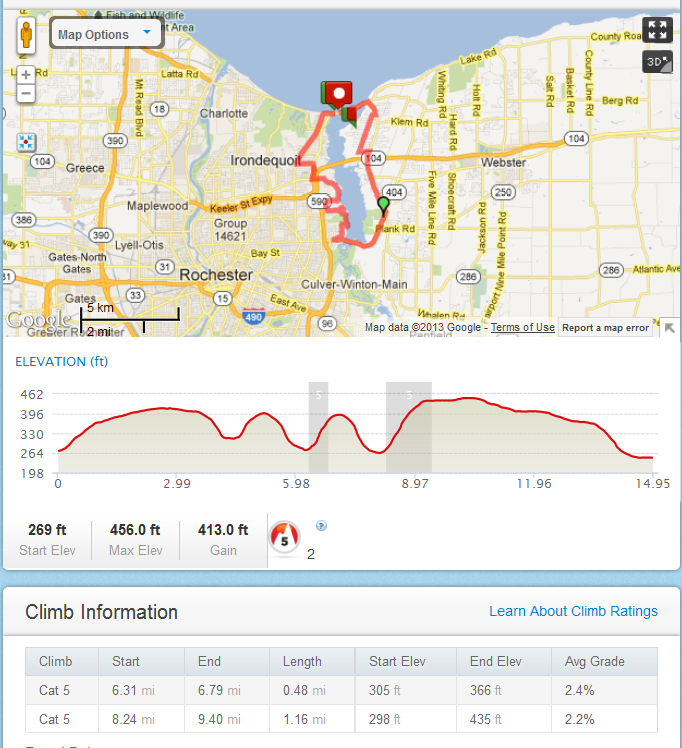 I've always wanted to try all those trails in Rochester though, I've heard they are awesome. There are always a ton of run chatters tweeting about them (all were probably there with you!). Glad you enjoyed it! A mix of both, definitely. I really enjoy the social side of running and how it can bring people together and create/solidify friendships... but I do enjoy getting out there on my own sometimes, especially for longer runs. I mostly run with a group of runners these days, which I love. But, I have to admit that I do miss having the occasional solo run as well. Group runs make hard ones easier, but sometimes, it's nice to have just you and your thoughts. Congrats on the 15 mile run! I haven't run with someone else in a very long time. Since I like to run early in the morning, very few other people are even conscious, and I don't know a lot of people in my area who run, and I'm sure those who do are way faster than I. The local running store hosts group runs, and I have thought of it from time to time, but with my husband's work schedule and the 4YO to tangle with, it just never seems to work out. Maybe someday - I can't say never! We enjoy runnin with you guys! Glad you can join some of our runs! I am a group runner myself - pretty social as it goes with running. I have a social run on most Saturday mornings for our logn runs. After we all go to breakfast. I think having the group setting helps teach and challenge me a little more - and of course we make great friends! During the week it doesn't really bother me to run alone, but I do like to have the mix of both. I'm still in the solo running stage unless I run with Allan but someday I'd like to run with a group.